As we already mentioned in several articles, mobility solutions are becoming more important every day. That is why we, from Viafirma, wanted to dedicate this post to do a review about mobility trends based on user preferences regarding to operating systems and browsers on mobile devices during the first quarter of 2016. Let’s start. In the last quarter of 2015, we talked about the importance of mobility and how it is gaining more value every day. Since professional have the needs (regardless to the sector in which they work) to be able to operate through their mobile devices, mobility is essential. During 2015, 80% of the users had access to the Internet via their mobile phone daily, compared with 67% who had access through the computer according to the IAB (Internet Advertising Bureau). In fact, it isn’t only about the need to operate from the mobile device, but also about devices which are interconnected and share information, ensuring that we have the information available everywhere. Hereby different people can work on the same information, but will not enter the cloud computing. While focusing on mobility, it is important to highlight how the European strategies are helping to improve the growth of solutions. The guidelines of Europe 2020 and especially Horizon 2020 put special emphasis on it. In this context, you can clearly see the importance of knowing the preferences of users regarding to the browsers and operating systems, and even more for businesses that are dedicated to providing mobility solutions –like Viafirma Documents and Viafirma Inbox, which are two of our best products for covering this need-, we must ensure that our applications work flawless on those preferred by our customers. Among the mobility trends, in this section we will focus on browsers. The following graph shows the overall performance of the most used browsers in the first quarter (December 2015 till March 2016) (Netmarketshare). In this graph we can see that, on mobile devices, the leader is Chrome (average of 42.7%), followed closely by Safari, who led until 2015. Safari lost followers in the last months and has been overtaken by Chrome last year, which explains the increase in Android phones or iPhone’s sales decline. On the other hand, Android, Opera and Internet Explorer browsers appear to be stable in the number of users they have, which is less than 20%. It is remarkable that if we compare the most used mobile devices compared with the statistics of Internet access through computer, the figures have such a big difference. Globally, Internet Explorer is still the market leader, but the trend seems to indicate that Chrome is finally going to rule in a few months. The evolution of operating systems on mobile devices globally (Netmarketshare). As shown in the graph, globally there is a clear dominance of Android with over 60% of the market share, followed by iOS with a share that has dropped 40%. Leaving less than 5% for all the other operating systems like Windows phone or Java me. We go back to 2014 to get a better overview of what has been the evolution of Android and IOS. Here we found, surprisingly, that the use of iOS has always maintained a downward trend except in the first half of 2015, when it seemed that remained stable. Since the summer of 2014 Android is catching up iOS, the operating system of Google has not stopped growing. It is getting the biggest gains in April and December of 2015. 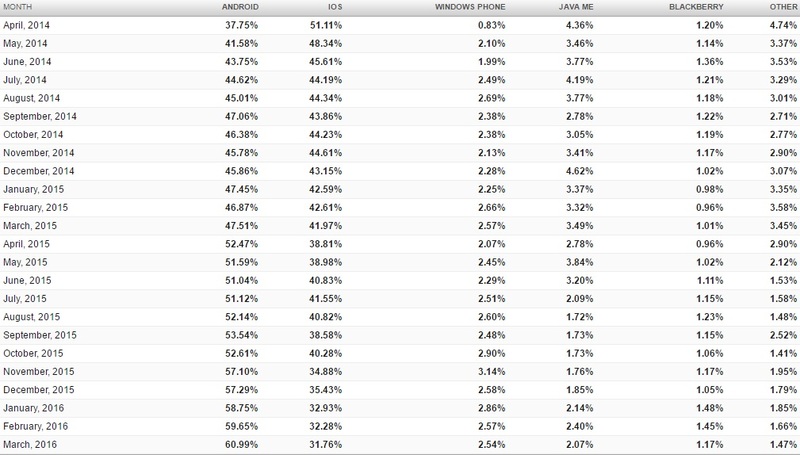 Since then the trend continues for the two leaders in SO; Android continues to grow while using iOS decreases. It is clear that 90% of the total market share is occupied by these two OS, so those who are developing applications, must take note and assure that they are fully compatible with Android and iOS. At last, we include the evolution of the most used resolutions for mobile devices. 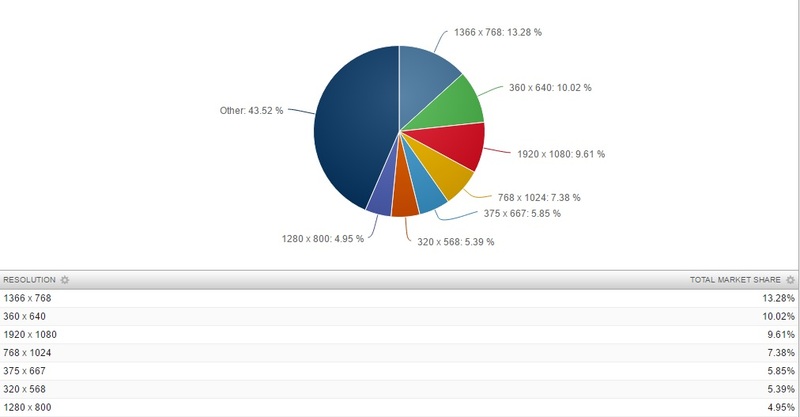 During 2016, the most common screen resolution, as shown in the graph, is 1366 x 768 with 13.28% which means a small decrement in comparison with 2015. The second resolution is 360 x 640, with 10.02% and maintaining the upward trend since 2015. These data demonstrate the lost of supremacy of large computer screens in comparison with screens of tablets and phones. In this article we have reviewed the trends in mobility during the first months of 2016 Browsers and preferred by mobile users globally operating systems. These data are certainly very useful for all those who are involved in the world of mobility. We hope you found it useful.